The real-time engagement provided by the mobile apps is essential for increasing the app branding and customer app engagement. It is a proven phenomenon that Mobile technology and more importantly mobile apps have become a dominant force in business and marketing with a global spending of about $35 billion. The facility of real-time engagement that the mobile apps provide is playing a pivotal role in enhancing the customer app engagement. A large number of brand marketers are increasingly using real-time engagement to give their business a potential shift from their contemporaries and make their product an eye-candy for the customers. Real-time engagement is mighty essential in enhancing the customer experience and thus has a soothing effect in defining their loyalty for the product. App branding also gets a major boost as the customer’s queries, their issues are efficiently resolved that results in better “Word of Mouth” publicity of the app or the product. To seize the attention of the customer, the organization needs to be nimble in their app branding strategy and mobile apps with their real-time engagement will be the apt ally for it. Although there is a steep increase in the number of app users around the globe, the average number of apps they use frequently is rising by the rate of a mere 0.3%. Mobile apps can well and truly be the extension of your brand and the brand name. As mobile apps have higher accessibility than the website and have multiple marketing channel resources so that the company can exhibit their plans in a better manner. The real-time engagement will help in filling the gap between the brands and their connection with the customers. Mobile apps also cater a chance of giving honest feedback to the customers, so that the app makers and the organization could figure out if there are any changes to be made. App branding can also be increased as the mobile apps define valiant strategies to improve the ultimate thing i.e. the user experience. The proactive real-time engagement will help the users to go to their work on the app in a smoother way and will also provide them and compel them to complete the task on the app more frequently. In addition to this, providing gifts and in-app purchases are the other ploys that an organization could deploy with the help of mobile apps. As we know that mobile apps provide accurate and up to the mark user analytics that can help in elevating the level of personalization as the organization will get a more detailed insight into the mood of their customers. Things like personalized messages and push notifications will also act as a catalyst in making the customers feel more wanted. Stats show that using push notifications can increase the proportion of app and customer retention by 180%. 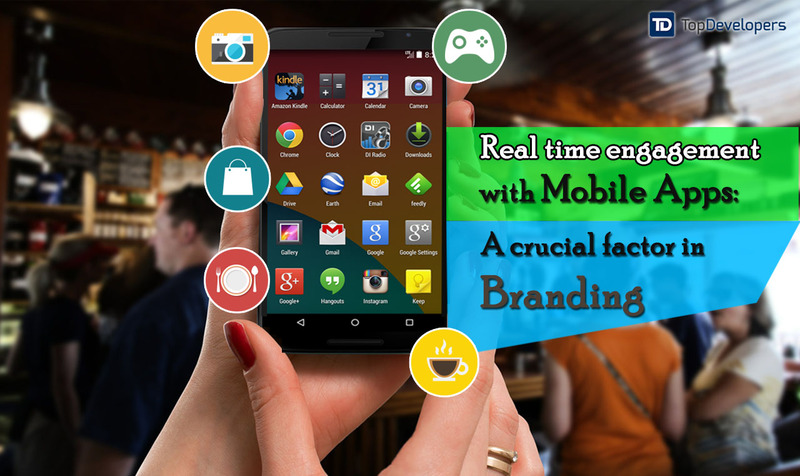 With real-time engagement through mobile apps, the organization can provide even the minutest of details about the product and provide the content which the customer is looking for. Relevant information such as event announcement related to the product, declaration of sales or arrival of new commodity could be fetched easily by the customer with the help of real-time engagement. We don’t need to understand the concept of quantum physics to understand the fact that mobile app development has been mighty impactful in making businesses flourish. Mobile apps have been the flag bearers of the app branding and constantly helped the companies to get their desired results. With real-time engagement, the mobile apps provide superior performance and user experience to the customers and the product which is easy to use is crucial for app engagement as well as branding. With the mobile app, you can also choose the option of location-based marketing with the Geolocation sensor in the app and can expand their business in various places. Mobile apps predominantly remove the hurdle of place and help the business and the brand to reach even the remotest of places without much difficulty. Companies should remember that no matter what the evolution of technology will be, a consumer will always remain the king. The app branding must be done according to likes of the customers. Real-time engagement in mobile apps will provide the perfect utility value to the product that will astoundingly increase the app engagement and the customers believe that the product is a must and viable for them.